I have a thing for hedgies. Sort of. I mean, I’m not someone who follows hedgehogs on Instagram or anything. But there’s something about coloring little hedgie stamps that….well, it just makes me wanna buy all the hedgies. 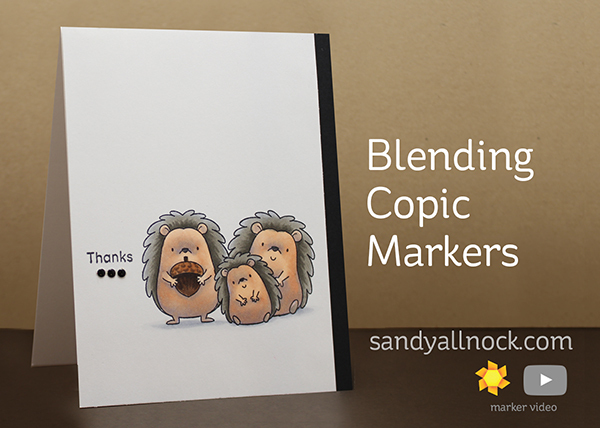 In today’s video, I’ve colored up three of the hedgies in the MFT stamp set. Note that there are a bunch of critters in the set – two of them have scarves so they can be used for Christmas; one holding an acorn for fall; and others holding nothing so they can be used year-round! Watch the video below or click HERE to see it in HD on YouTube. For my card designs, I kept them simple; popped the 4″ x 5.5″ panels after attaching a strip of black scrap to the card base. Just that little bit of popping up a panel adds so much! A little bling bling, and it’s all done and ready for the mail! Love your videos – I always learn something and your copic and Brusho coloring is outstanding! 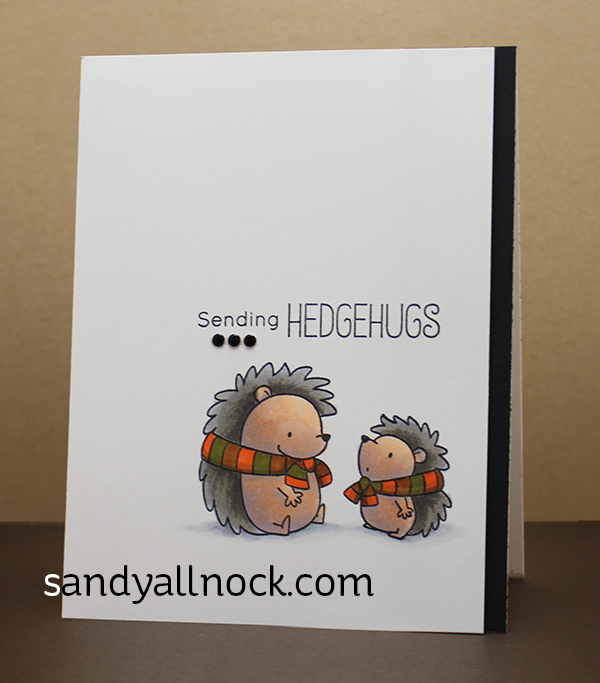 Love both of the hedge hog cards. Do you use memento ink when stamping to color with copics? What do you think of pan pastels? That is one thing I have not invested it as they seem so pricy – can we get the look with other similar products? Thank you and your pups are adorable!! Super cute little guys, great cards! Great cards. Love watching you bring stamps to life. I also watched your puppies video and they are adorable. I love the little hogs as well. These have great expressions! I’m with ya on those adorable hedgies! Nice coloring!